When I was young, my mom used to make me and my siblings monster cookies. They were absolutely amazing. 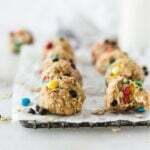 Gooey peanut butter oatmeal cookies the size of your face with m&ms and chocolate chips? Yes, please. While my sister was notorious for being the child to always eat half the dough before the cookies were ever baked, I always snuck bites of monster cookie dough, too. It was just so good, especially when it was chilled, just sitting in the refrigerator begging you to sneak a little bite! These monster cookie snack bites are kind of like monster cookies dough. Minus the risk of salmonella. Although if we’re being real here, has anyone ever been poisoned with salmonella from raw cookie dough? I highly doubt it. I think it’s just a thing grown ups say so they can actually get the cookies into the oven before the dough is gone. Or something like that. Back to the monster cookie snack bites. They are incredible. They taste just like monster cookie dough, but no raw eggs, no butter, and definitely not heaps of brown sugar. Just 5 easy ingredients, and half of them are healthy! I keep the added sugar in check by using peanut butter with no added sugar, though you are still going to get some sugar from the chocolate chips and m&ms. But that’s what makes them so fun! 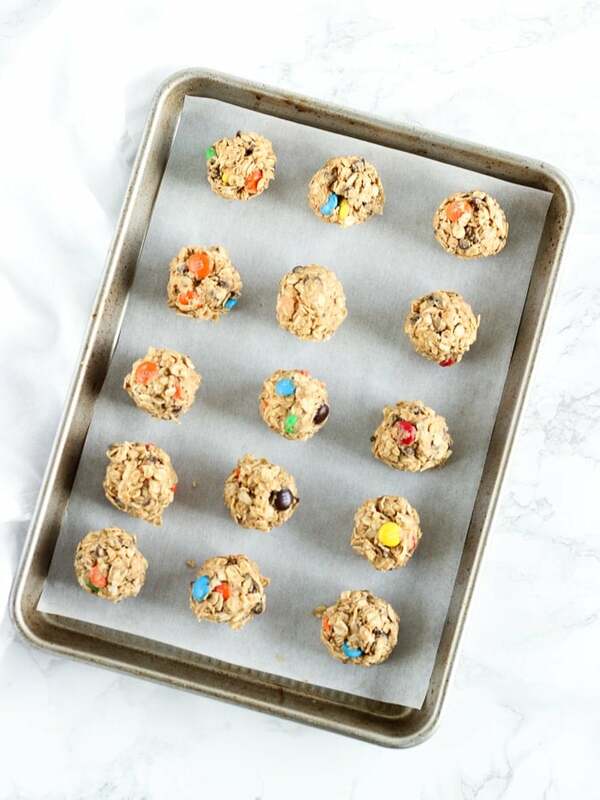 These little cookie bites are no-bake, so they take all of 5 minutes to make. Then you can chill them and pop one or two whenever you need a quick snack or dessert that’s healthy yet satisfying. 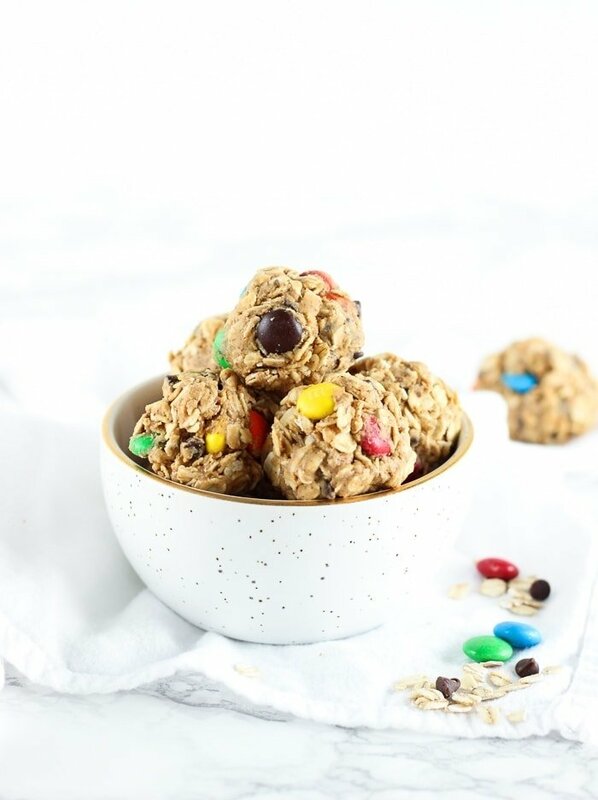 Not that m&ms are necessarily healthy, but these are basically oatmeal balls, so they’re healthy-ish, right? I’m going to say yes. 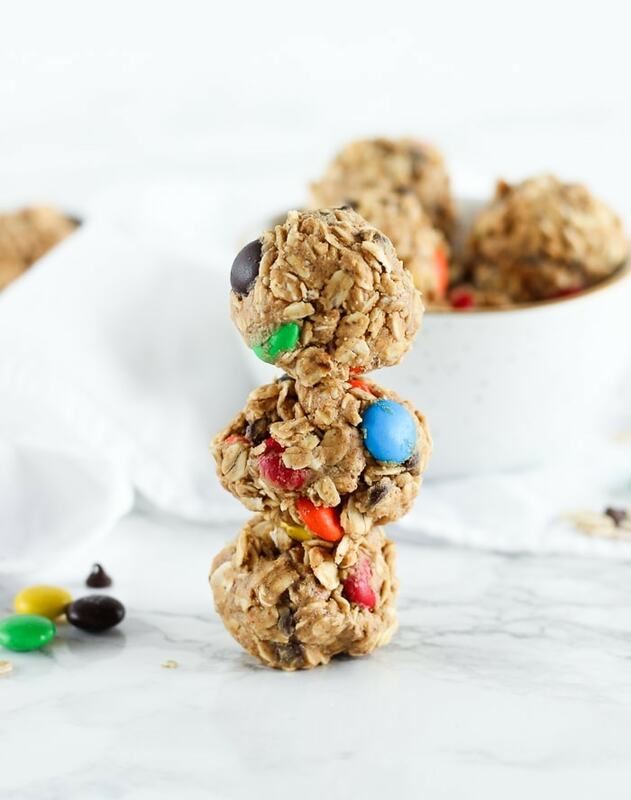 Make these super easy, no-bake, 5 ingredient monster cookie bites, ASAP. You won’t regret it! Use your hands to roll mixture into 1 to 1 1/2 inch balls. Place on a cookie sheet lined with parchment or a silicone baking mat. Refrigerate balls to let them firm up, then place them into an airtight container.